This is a guide about making crispy breakfast potatoes. Getting that perfect balance of crispy exterior while keeping a soft inside can be tough to achieve. 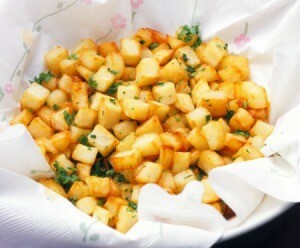 Here is a great recipe to try for crispy breakfast potatoes. My roommate in college used to make us potatoes for breakfast on weekend mornings. Her potatoes were always crisp on the outside and tender inside. I've been trying to make them ever since. Mine usually were raw inside, or mashed potatoes. I finally discovered the answer, an electric skillet. Here is my technique. Using a fork, poke holes in the potatoes as if you were baking them. Cook them for 5 minutes in the microwave. Using an electric skillet, cook bacon or sausage to desired consistency and remove from pan. Save about 2 Tbsp. of drippings in the pan. If you would rather have vegetarian potatoes or are using cooked ham, add about 2 Tbsp. of oil. Chop cooked potatoes into 1/2 inch squares. Cook vegetables at a high heat (375 degrees F) until softened and moisture has been evaporated. Add potatoes and more drippings or oil, if necessary. Cover pan, and let sit for about 5 minutes. Stir potatoes and let sit again. The potatoes should brown nicely. Add in meat at this time, if desired. I also like to season with salt and pepper, any herbs or spices I have on hand, and Worcestershire sauce. Serve when they are as brown as you like. Sometimes I will melt cheese on top before serving. Thank you for sharing how to make crispy breakfast potatoes. I am always searching for the perfect recipe!